(NaturalNews) In a stunning medical breakthrough for humanity, a hemp cannabidiol (CBD) product from Medical Marijuana, Inc. has been approved by the government of Brazil as a treatment for cancer. The product, called Real Scientific Hemp Oil (RSHO), is also approved by Brazil as a prescription medication for epilepsy, Parkinson's disease, and chronic pain. This move puts Brazil far ahead of the United States in the realm of compassionate, safe, affordable medicine that can treat serious medical conditions such as cancer. 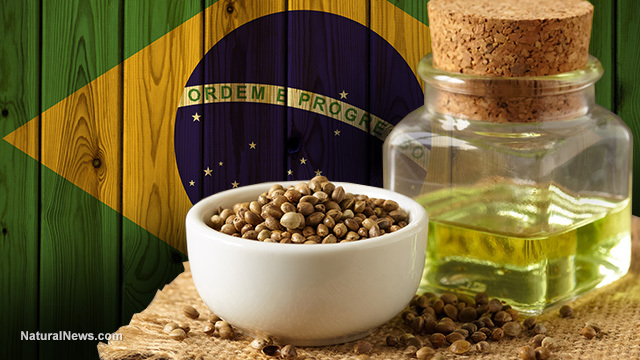 "We have the utmost respect for the Brazilian government that decided hemp CBD oil should be available to their people, for a variety of reasons," said Stuart W. Titus, PhD and Chief Executive Officer of Medical Marijuana, Inc. "Brazil is a shining example of how a national government has responded to humanitarian interests and has swiftly and diligently passed favorable legislation on behalf of the health and well-being of its people – children in particular." "Today, any resident of Brazil who has a government-approved medical indication can have access to RSHO hemp oil products and may do so with both a doctor's prescription and government-approved import documentation," reads a press release announcing Medical Marijuana, Inc's partnership with HempMeds Brasil. CBD and hemp products are notorious for being counterfeit or contaminated. Because the hemp industry exists in a "Wild West" atmosphere, some hemp growers use toxic pesticides, herbicides and extraction solvents to create their hemp products. In contrast, Medical Marijuana, Inc. works with a laboratory to quantitate and validate the CBD content of its products. Medical marijuana, in all its forms, is a major disruptor of cancer profits, which is why it will be aggressively and viciously attacked by the insidious for-profit cancer establishment. For this reason, you can expect extreme resistance against CBD and medical marijuana by the U.S. medical system... even when such natural products could undoubtedly save lives, ease suffering and vastly reduce cancer treatment medical costs. In the view of Natural News, access to medical marijuana is a fundamental human right that shall not be infringed by any government. We aim to help companies like Medical Marijuana, Inc. (and other providers of CBD / hemp products) succeed in overthrowing the corrupt regulatory regime that now occupies Washington D.C. Federal agencies like the FDA and EPA now actively work to poison the people (with lead in the water and weed killer in the food) and deny them access to safe, affordable natural medicines that could save lives and reduce medical costs across the country. Hemp agriculture should be legalized across America, and CBD should be universally legalized as a safe, effective natural medicine. If Brazil can do it, why can't the United States? We also need a regulatory environment in which truthful, scientifically validated claims of CBD efficacy to treat diseases can be communicated to potential customers without company executives being accused of criminal conduct by the FTC. We don't need more synthetic drugs to defeat cancer... Mother Nature has already provided the food and medicine that works! It seems that Medical Marijuana, Inc. is making great strides toward this goal, and we strongly support their efforts in the name of compassion and humanity. Cancer is one of the leading causes of death in the USA and around the world. While the for-profit cancer industry wastes billions in their fraudulent "search for the cure," the real cures and treatments for cancer already exist in plants provided by Mother Nature. I STRONGLY urge hemp customers to demand strict scientific analysis of hemp and CBD products before purchasing them. Counterfeiting is widespread across the industry. Also please note that progesterone can be used to adulterate CBD products because progesterone has identical molecular mass and could fool laboratories that don't know how to separate isobaric molecules. Progesterone's molecular formula is identical to CBD. C21H20O2 - see this link at Chemspider.com.